From our animal statue collection we present this gorgeous pig statue that will promise to bring a bit of whimsy and playfulness into your home or garden. This durable statue is made from a cast resin mold mixed with fiberglass. Not a detail has been overlooked on this fabulous large pig statue as it is hand painted flawlessly. 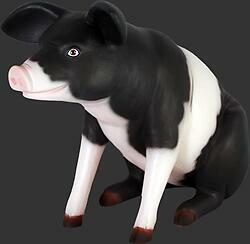 This pig statue is sure to add unique style to any special event or commercial decor setting. If displaying this statue outdoors, we recommend applying a polyurethane clear coating as needed to protect from weather.